My friend Shelly wrote this helpful Back To School Tips From A Teacher for me to share with y’all! I don’t have any kids. 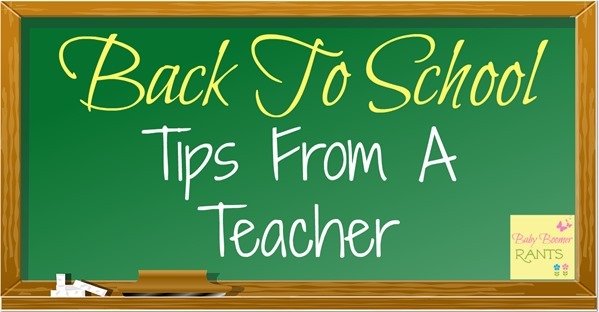 (You might be wondering why in the world, I would be giving you back to school tips then….) I am a teacher. I have lots of experience with what kids need for back to school! It is NOT necessary to buy your child a ton of clothes for back to school. A new outfit for the first day might be nice, but if their summer clothes still fit, I wouldn’t go out and buy a ton of new ones. Your child will probably need lots of new clothes when the weather gets cooler, but why buy new warm weather items? The most important thing that my students can have is a nice pair of comfortable tennis shoes. Recess and gym are so much easier when this is the case! These are great inexpensive options. Ask the cashier which day of the week they put out new merchandise. This can help you decide which day to shop, because the best items will be there on that day. There are about 4-5 more weeks of great yard sales this summer, and I think you will be surprised at the deals you can find. Kids can be hard to shop for on clearance racks, because you never know what size they will be the next year. But sometimes, you can catch the clearance items to finish up the season. Gymboree and Kohl’s both have great coupon sales, as well as many other stores. Watch out for these special offers, and you can save a ton. Check out Mr. Rebates for coupon codes and cash back on back to school shopping. Do you have friends or family with kids older than your own? This makes a perfect opportunity for Hand Me Downs. Many times kids grow out of their clothes so fast that this is ideal. The clothes are still nice, and what is better than free?. What is your best tip for shopping for back to school clothes? Great back to school tips! We have tons of yard sales in our area and I take full advantage of buying my kids clothes at them when the clothes are in good, clean shape of course! Yard sales are a great resource for back to school clothes. I have found almost brand new clothes before! I enjoyed this article even though we homeschool! (I found you on Good Tips Tuesday.) Thanks for the reminder that there are more important priorities in life and school than having new clothes! I homeschooled all of mine, too. But, I know there are many who can benefit from the advice in the post. We have done a lot of these things. I have to say, my favorite is hand me downs. You can’t beat them! Absolutely – it is a real game changer and money saver!